WATER: The majority of baby chick fatality is because the chick does not start to drink right away. Water is more important than feed on the first day. Never let them run out of water. For the first 24 hours, add 1 tablespoon of molasses/gallon of water (sugar water). On the 2nd day add vitamins-electrolytes to water. One gallon waterer is adequate for 50 chicks. Even if its self-filling there MUST be 1 waterer per 50 birds to prevent overcrowding. If you choose to use apple cider vinegar, it is very important not to use more than 1 teaspoon per quart of water and do not use a metal waterer with it as the acid will corrode the metal causing it to leach into the water. *Ducks may swim in water after 4 weeks. Attempt to keep them dry until then. 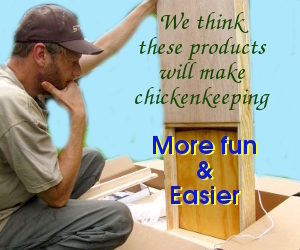 *One-foot minimum feeder/waterer space per 25 chicks to prevent over-crowding. 0-18 weeks: Flockraiser 20% until harvesting or until 18 weeks for layers. Flockraiser is available with medication or without medication. If using medicated, we recommend that it is used for the first 2-3 weeks. Chicks need to be taken off medicated feed within 2 weeks of harvesting. 0-4 weeks: Prince Broiler Starter 25% Non med. 4 weeks to finish: Broiler Finisher 20% Non med. HEAT: Use a heat lamp in a draft-free area. Place heat lamp approximately 20” above chicks. Baby chicks need a temperature of 95 degrees. Please use a thermometer to be sure you have them at the correct temperature. You will lose chicks if they are too hot or too cold. If they huddle together, they are too cold. If they huddle in corners, they are too hot. Reduce 5 degrees each week to a minimum of 65 degrees. BEDDING: Straw or Large Flake wood shavings are the best choice for chickens and turkeys. Allow approximately ½ square foot per chick, and 1 ½ square feet per adult. Straw is the best choice for ducks and geese. *A 10’ X 10’ brooder house is adequate until 8 weeks of age. It’s all about the eggs. I was recently asked if hens would lay eggs whether a rooster is around or not. Many people even ask me if they need a rooster to have eggs. I respond, “Your chickens will still lay eggs without a rooster, they just wont be fertile without one”. When all chickens begin laying their first eggs do not get upset about the size. The majority of chickens will lay smaller eggs at first before they lay their full sized eggs. I guess you can say this is God’s was of breaking them in. Did you know how many different breeds of chickens there are out there? All of them lay eggs more or less frequently than others. Leghorns are the primary commercial egg layer breed laying around 280 eggs per year. Buff Orpingtons are the primary breed of chicken that we have because they are a fluent egg layer, large eggs, and lay around 280 eggs per year. You might say, “well that’s not even one a day”. Fact is, no chickens lay an egg every single day of the year. Gloomy weather will cause a chicken to miss a day or two of laying, sickness will affect their laying, and each year they have a molt where they shed and grow new feathers and during this period they will lay few or no eggs at all lasting up to three months. This means the winter weather can cause chickens to lay very little eggs due to the cold and gloomy weather. I personally keep anywhere between 25-40 chickens at one time and on one of those is a rooster. During the winter months ill be lucky to have 15 eggs a day. Sometimes I can trick my chickens into laying more by turning on a lamp inside the coop with them to trick them into thinking its bright and sunny out. I did read a book one time where a Black Australorp had laid record 364 eggs in a year. But most breeds will take a day or two off each week. Some chickens will even be broody for up to a three-week period each year. Mother Earth News worked with Skaggs Nutrition Laboratory at Utah State University and Food Products Laboratory in Portland, Oregon, to test free-range chicken eggs versus store bought eggs. The free-range eggs contained four to six times as much Vitamin A; Twice as much omega-3 fatty acid; half as much Cholesterol, a quarter as much Saturated Fat of commercial eggs. There are many people that think all brown eggs are free-range eggs, but actually the color of the eggs has nothing to do with the diet of the chickens and almost everything to do with the breed of the chicken. I found this interesting but often the egg colors are linked with the color of the chicken’s earlobes. Red earlobes generally mean they have white eggs. White earlobes have brown eggs. This does not hold true to all breeds but it does apply to the majority. Some chickens are even thought to have Easter colored eggs. The Araucanas & Ameraucanas lay blue eggs. I hope this article has helped Eggucate you. No matter what kind of chickens you choose to raise, you really cannot make a wrong choice. Raising them to be free-range chickens will give you the benefits of healthier & more nutritional eggs than commercial ones.